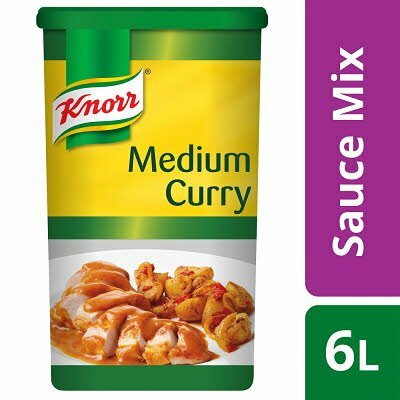 Medium curry sauce mix. Ideal as a sauce for chips, rice, beef, chicken, prawns and vegetables. Palm fat, sugar, curry powder (14%) (turmeric, coriander, cumin, black pepper, fenugreek seed, red chilli pepper, cardamom),modified potato starch, tomato puree powder, skimmed MILK powder, onion powder, salt, yeast extract, rice flour, apple powder, potato starch,cayenne pepper, lactose (MILK), caramel syrup, MILK proteins, maltodextrin, acidity regulators (sodium diacetate, calcium lactate), flavourings, citric acid, lactic acid, thickener (guar gum), garlic.